The Grand Tableau (GT) is the Big Mama of all spreads when considering the Petit Lenormand deck. But there is nothing petit about this spread. A massive lay-out of all 36 cards in the deck, this very comprehensive spread shows all the major issues in the seeker's life. Verbally working through a complete Grand Tableau reading can take 1-2 hours. 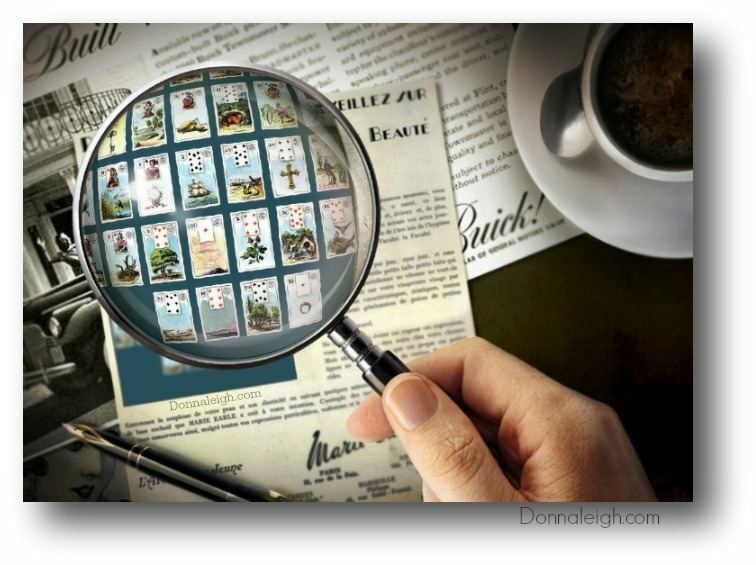 About once or twice a week I'll get an email from someone asking, "I'm learning Lenormand. I can't figure out what this Grand Tableau spread means. Can you look at this picture and tell me what this spread says?" Not only would take hours to do (if not days in writing), this monumental task cannot be done by the student until they learn to take apart the smaller pieces. The GT should NOT be the spread to tackle when you are first learning to read the Lenormand. While it is fun to watch a skilled reader walk through a Grand Tableau to get a concept of how this oracle can work at its fullest, it is not the spread for a new reader. This massive spread is made up of many, many smaller bits: multiple mini spreads. Learn to do the smaller spreads first. Don't try to sky dive before you even learn to fly. The good news is: the small spreads you'll be learning as you begin reading the Lenormand are not wasted time. They are the very building blocks to the GT. The GT is loaded with line readings, 2-3 card combinations, 9-card block readings, and more. Just like you can't build a brick house until you learn to mortar the bricks together, the GT can't be read successfully until you learn these smaller spreads that comprise it. These smaller pieces, the practice spreads you are doing as you earn your wings, are the very bricks and mortar that build a GT. You will be able to navigate your way through the whopper GT spread after thoroughly learning them, as you have then learned its language. It's like learning the grammar of a country before traveling somewhere to conversate with the locals. Learn the individual words first, become versed in putting them into sentences, and then try talking with a native speaker. Are Ready to Try Your First Grand Tableau? Chances are, when you are at the point when you can successfully read a 9-card block spread with fluency, you may be ready to take a little test drive with a GT. But in order to read a 9-card spread, you'll first need to learn how to read smaller 2-3 card spreads. Working with the 9-card block spread will allow a variety of cards to engage with each other around a theme. Once you have the 9-card reading concept down, you can apply this skill to your GT spead and plug 9 card reaedings around theme cards in your GT. Slowly, you'll learn to shift your practiced skills into the GT and realize that it is really just made up of all of Mama's children: many smaller sections, each containing their own context-specific revelations. With the GT, start by focusing on cards that represent areas of your life and read around them. Learn about love by finding the heart, discover what's immediately surrounding you by finding the woman or man significator (depending on which gender fits you), and explore the surrounding cards of each of these as 9-card block spreads. Do readings on yourself and learn to assimilate the cards into your own life experience. Read about a situation you already know to make connections between cards and meanings, because you will be able to validate card meanings as you test drive your skills. If you're looking at cards positioned in the future, take notes about predictions so you can check back later to determine accuracy. There will be lines of cards to read, corners, diagonals, and lots of fun card relationships to explore (more in the videos shown below). When starting to navigate the GT, it's okay to tackle only certain areas of the spread with your first tries. You don't have to eat the whole cake in one mouthful. If you've ever tried to learn to drive a standard ("stick") car, you may remember that the first several drives around were likely a little choppy and awkward. It gets better, smoother and more fun with practice. Likewise here....you may start a little staccato as you bumble around your first GT, but better flow and efficiency will come with practice. Look at the lines of cards that precede or follow significators and topic cards. All of these can be done if you've had prior practice with your smaller readings. Focus on these smaller bits on your way through the GT, but only after having done them individually outside of the GT for practice. GTs are not meant to be done on one person every day. A GT typically covers a period of 3-4 months (or up to a year if you decide that before starting the reading). So for additional practice readings you may need to use other contexts as your spread's subject matter: books, movies, and other familiar situations. Use those as you learn to navigate your way through a GT. Also, a GT is not appropriate or practical for every reading you do. Typically, an entire GT is not thrown to answer a single question. The GT is extensive and addresses all the major areas of a person's life. So while it can be used to answer individual questions by exploring those cards in the GT spread (your love card, your work card, your money card, etc. ), if all you have is one question, a smaller spread will likely suffice and be more practical. Many times there is no question when the GT spread is arranged on the table. It is the perfect spread if someone says, "I'd like a general reading about what's happening in my life right now and what's to come in the next 4 months." But you will want to get plenty of practice. So do free readings on friends if you can, and participate in Lenormand groups with a learning-focused environment, as the internet is rich with opportunities for practice. Experience will be your best friend. Practice, practice, practice. So where do you go when you want GT help? randomly drawn GT in a magnifying glass. The bottom 4 Destiny Cards tell us what we need to do. The cards above suggest establishing a relationship (ring) in a group, a social network or group (garden, stars) and posting there (letter). Meet with like-minded people. Post a question about your GT picture online or ask questions at a meet-up group. Use internet groups (stars/garden) to your advantage. Read, post, ask, learn. If you're looking for online places to visit to learn to practice Lenormand readings and ask questions, THIS RESOURCE LIST offers links to many places you can go, most of them free. I also highly recommend The Grand Tableau Self-Paced Course by the Sassy Sibyl if you feel you need guidance through the process of navigating your first GTs. I test-drove the video version of her course and enjoyed it very much. 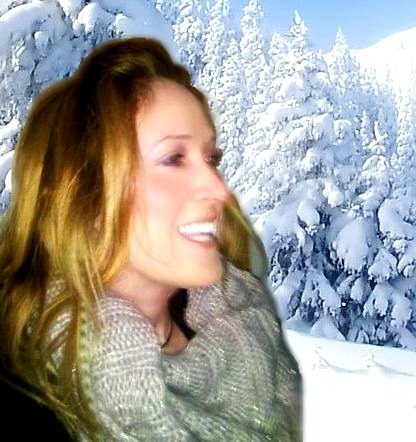 Melissa is a lot of fun with very positive, supportive energy. 1) Post a CLEAR picture. Tiny, blurry pictures can't be read. If you can't get a good picture of all the cards, you're better off posting just the section of the GT about which you're inquiring. 2) Avoid writing card titles or numbers in lieu of a picture for large spreads. For many readiers, this makes it much more difficult to assimilate multiple cards quickly and see them how they're arranged in relationship to each other. 3) Ask ONE or TWO succinct questions about your GT picture. Do not expect that people will respond to an open ended question like, "what does this GT spread mean," when it could take them days to write interpretations. You'll scare everyone away if you expect that kind of time and energy commitment to a post. Instead, ask something specific about a smaller part of the GT. An example would be something like, "I am not sure what I'm seeing around the heart card in my GT..." then offer what you see and ask for more assistance to clarify. If you have more than one question about your GT, it's okay to post more than one thread about different parts of your GT, each tackling a specific area of the GT to reduce confusion with replies. 4) Offer your own interpretation suggestions before expecting others to provide the interpretation for you. This is a great way to earn your your wings without being spoon-fed answers. It also helps people understand the context of your inquiry if they need that. You may want to post something like, "I am looking into my relationship. Around the heart I see _______, which suggests ______. Does anyone see something other than this?" 5) It helps people to view the full GT image if you are inquiring about the impact of houses on cards in your spread. People will need to see which GT spread you are using (is it the 8 x 4 + 4, or is it the 9 x 4 spread?). They'll also need to see where in the GT the topic card and surrounding cards land in order to view which houses are occupied. 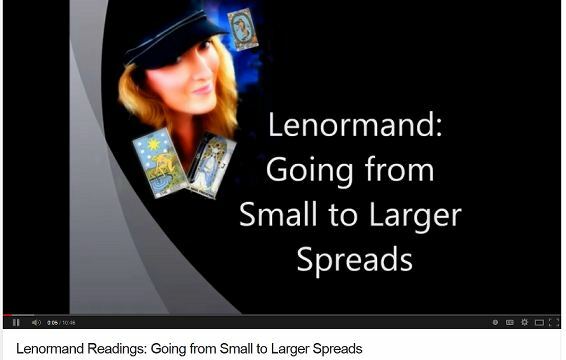 Here is a video tutorial that shows an activity on how to grow from small to larger spreads. Click on the image below, or Click Here. See an actual GT reading in action. 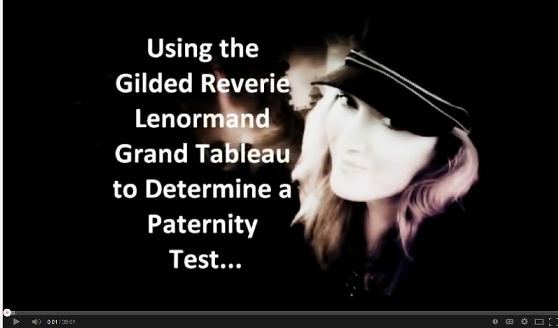 regarding someone's real question about a paternity test. but several people have written me that this video was their epiphany about GTs. To view, click on the image below, or CLICK HERE. Here's wishing you a magical Lenormand journey.